Last week I shared that this past year I have been attempting to simplify and detoxify my everyday life. Part of this process started one day after I had randomly pinned a few posts on DIY products. I had yet to actually click and read any of these DIY recipes. I went to use my lotion and I remember thinking "well this can't be that hard to make" and I turned over the bottle to look at the ingredients list and it was a mile long! Now I have to admit I did not jump in and research what all those ingredients were (because I did not know what more then half of them were). But I thought there surely was something I could make, with fewer ingredients - ones that I actually knew! That's when I started clicking through Pinterest. I made my first batch last spring. I have tried many different recipes and combinations there of. I'm going to share with you the current recipe that I am using and liking right now. All of my ingredients pictured above I purchased from Bulk Apothecary. I have found they have the best prices for the ingredients I use. And whenever I am ordering anything online I always quickly check RetailMeNot.com to see if there are any coupon codes available. I think I have used one every time I have placed an order at Bulk Apothecary. The only ingredient I use in my recipes not from there is my coconut oil which I buy in a large tub at Costco. On average I have calculated that the ingredients for one batch of this recipe comes to about $3.50. 1. Measure out 6 oz of your liquid oil. My preferred combination right now is 2 oz. Avocado Oil, 2 oz. Almond Oil, and 2 oz. Grapeseed Oil. I found this awesome glass at World Market which makes this recipe so simple! 2. Float in 3 oz. of your liquid oil. In this batch I used Shea butter. Sometimes I use coconut oil, and sometimes half and half. I like them both, but I love the subtle sent of the coconut oil. 3. Next, float in 1 oz. of beeswax. 4. After you have all your ingredients measured out. Melt them down in a double boiler (or your version of one). It does not take long as long as you keep stirring. 5. Next you get to mix everything together. You have two options. You can use your food processor or your blender. I have used both, they both work well and they are both a pain to clean up. It works the same with either, the idea is just to mix together the oil mixture and your 9 oz. of purified water. Put part of your water in your food processor, add in the oil mixture and blend. Continue adding in the remaining water until everything is mixed together. 6. Now is the time to add an essential oils if you wish. If I am using Shea butter I like to add bergamot oil. If I am using coconut oil I like to add lavender oil. 7. 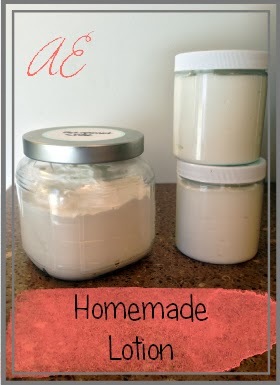 Fill your empty containers, let cool and voila - homemade lotion! The whole process is really not difficult, nor time consuming. I usually make a few batches at once, and it lasts me a few weeks. I love that I know exactly what is in them. This is probably the first winter in a long time that I felt like I haven't had to deal with unbearably dry skin. My least favorite part of the whole process is cleaning up. If there is a secret to quickly and effectively get all of the oils cleaned out of the food processor or blender, I need to know about it! I hope someone else is inspired to give it a try.